I have a cedar deck that is three years old. 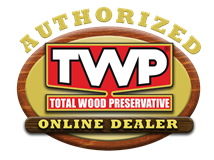 every year, I have used B Moore Arbor coat semi Trans Oil Based Cedar stain following the recommended cleaning procedure. I am not at all satisfied with the longevity of this overpriced product. 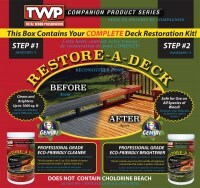 I would like to start over by using the Gemini restore kit and then TWP oil based. Once the deck is prepped and allowed to dry. Am I correct in my understanding that your product is a two coat wet on wet process? Also, were can I see your color samples? 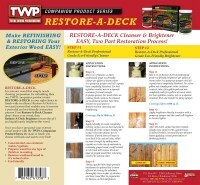 I am about to use Restore-A-Deck on 4+ years old White Oak outdoor park benches. There is no close by water source. I will be taking 2 or 3 5 gallon buckets of water. I can get more if required. 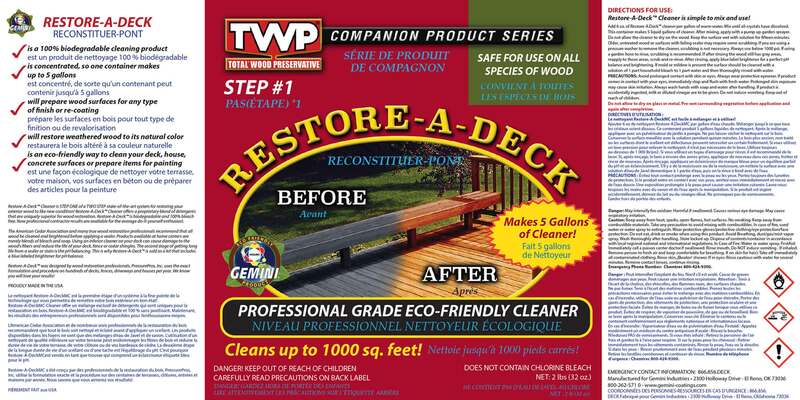 Can I use Step #1 on one day and Step #2 on the next day and following that a few days later with the TWP Stain I also purchased? Step 1 and Step 2 should be the same day. Apply the Step 1 and scrub to remove all graying and dirt. Rinse and apply the Step 2 right away. Rinse and let dry for 48 hours before staining. The Gemini Kit does not harm glass but make sure to rinse well when done and while wet to remove any soap, dirt, etc. It will make the cleanup much easier. I have pressure washed my 6 yr old unstained deck. Do I really need to clean and brighten it? Also i want to approximate the chocolate brown trim on my windows; which color would be closest to a med-dark chocolate i.e. no red tone.? Yes, you should clean and brighten. Prep is key in the final outcome and performance. Dark Oak color would be closest. I cleaned, brightened and coated my cedar deck with pecan, 1500 last year. There has been some fading, not severe. 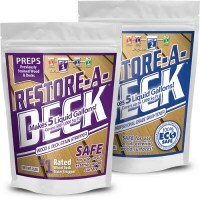 I plan to clean the deck and recoat this year. Is it necessary to use brightener after cleaning? Will that lighten the existing stain/finish? You do not have to brighten when doing a maintenance coat and the current stain is still intact. You can though. No, it will not lighten the color of the stain. I had a fryer boil over on my deck and it appears to have stained the wood. The deck is about 2 years old and it's nnever been stained or sealed. What product do you recommend to clean, prep, and seal ?and will it remove the grease stain along with power washing? Grease stains will not come out of wood. Best to replace those boards that are affected. 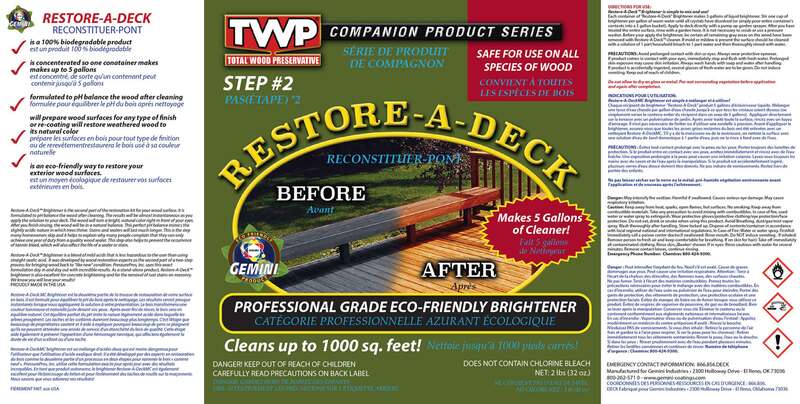 Once replaced, prep with the Gemini Restore Kit and stain with the TWP. Hello, I stained my deck in September prior to winter last year. 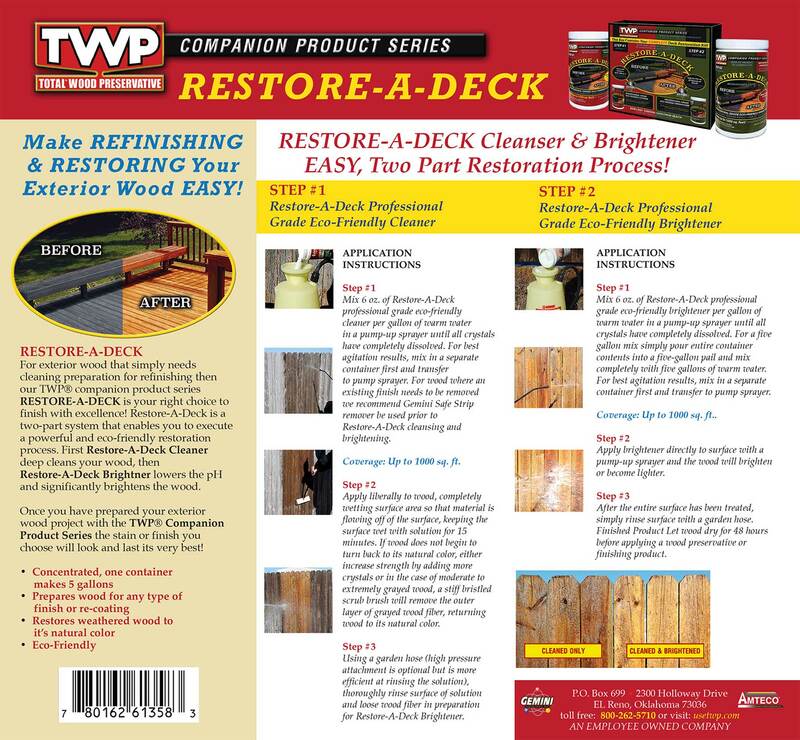 I utilized the Natural finish TWP 1500 series. I noticed some light spots in the deck. It's been seven months. Should I wash the deck down and apply another coat of stain or do I need to restore. It's faded in some spots only??? I was gonna apply one coat prior to summer over the decking?? Prep with the Restore Kit first and apply another coat. Will this remove paint from the deck rails. We just painted and worried if it gets on paint it will remove it. This product does not remove paint. 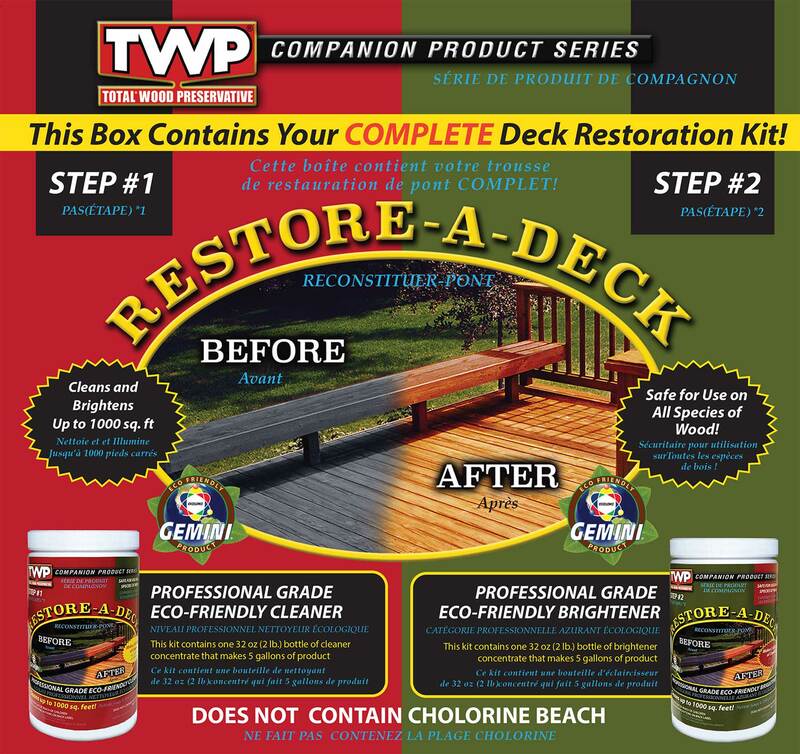 Hi there - I am about to clean, brighten and stain my newly installed deck (9/16) with 120. This weekend, a team installed flagstone on surrounding concrete patio areas and some of the concrete got on the deck itself, not to mention puppy print stains from the surrounding yard. The mortar spots are very minor - but the red puppy paw stains are pretty prevalent. Did not want to start until I knew if it would be a problem, and if so, how to deal with it properly before staining. Thanks! Both have to be removed. The cleaner and brightener with pressure washing should remove the paw prints. Not sure if it will remove the mortar spots or how to remove if it does not.